With previous experience hiring skilled workers, we can assist you to decide if hiring a temporary foreign worker is best for your needs. We can assist you to determine a good settlement plan for their arrival and assist you to apply for permission from the Federal Government to hire. We are well experienced with Temporary Work permits, extensions and accompanying family applications. Currently, we do not operate as an Employment Agency to provide candidates. If you require an agency, we can assist you in finding one with high integrity. We also have had success with companies who want to do their own recruiting. For employers who want to keep their employees permanently, we can assist you with the Employer application as well as strategies for effective retention of your staff once they are permanent residence. We work with all employees to submit their applications once the employer application is approved. We are versatile in traveling to your location to meet with employees who may not qualify under regular programs. We can assist them to identify how they may obtain permanent residence status and any steps they may be able to take to improve their chance for success. This is a new program launched to assist employers or agencies with a large number of foreign workers. Our high-level technical resources allow us to easily track expiry dates, application processing times, rotation of staff and other key deadlines that may affect your work team. This services is custom designed for your needs. 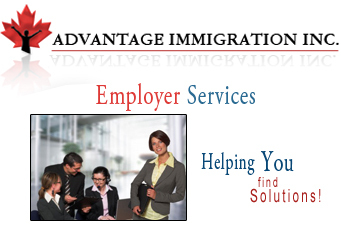 Copyright 2007 - Advantage Immigration Inc.